It may be close to grillin’ time in some parts of the country, but other regions are going to have to wait. Grilled meat may be the number one item people think about when breaking out the charcoal, but grilled corn surely deserves a place at the table. 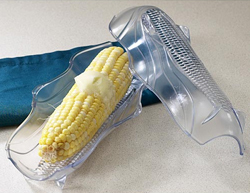 The Corn Butter Boat Trays can help you get through those long nights far removed from a hot grill. It may not be grilled corn, but that doesn’t mean you can’t have quick, easy and delicious corn on the cob. The trays allow for the ability to steam an ear of corn in the microwave in about 2-3 minutes. When grillin’ season finally does arrive, you could use these trays to serve those grilled ears, complete with melted butter. Suddenly, winter doesn’t seem so long.